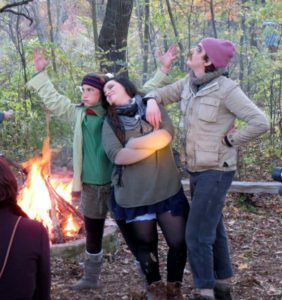 When I think back on The Performance Ecology Project, performed outdoors in the campfire circle at the Urban Ecology Center Riverside, I recall something like a green kaleidoscope: ever-changing figures in motion; people, animals, stories and poetry set to haunting music as the fading October daylight mixes with firelight against a leafy autumn backdrop, swirling and juxtaposing to create a complex weave, like the flavors of an artisanal meal. It’s odd that my memories should be so impressionistic—considering that I created the project, crafted its script, and was there at all the rehearsals (not to mention playing ad hoc stage manager and lighting guy). But the show was the product of many minds: from the performers’ field notes and sketches, to the cornucopian artistry of director Brian Rott, to the voices of the many creatures whom the cast encountered over the course of five Sunday mornings immersing themselves in the urban wildspace of the Rotary Centennial Arboretum. It became so much more than I had imagined—like a miraculous tree sprouting inside an alchemist’s flask. The experiment was to see if somatic practices could enhance our ability to empathize with non-human life. This is not quite as flaky as it sounds; the sciences of animal intelligence and emotions have really taken off in the last decade, and biologists who might once have dismissed any such talk as naive anthropomorphism are now studying the tangible effects that animal experience has in the world. Our performer’s mission was straightforward enough: after taking a class in yoga, mindfulness, dance improvisation, tai chi, and theater games to ground them in the present moment, they ventured into the park on solo explorations: seeking some living thing to “interview;” to literally look into, listen to, and try to discern it’s unique voice (neurological research has found that such contemplative practices can alter our brain activity, letting us attend more to present sensations than to plans and schemes). The performers created performance sketches from their experiences, and also kept field journals, from which material the script was assembled. The goal: to explore a different relationship between human beings and the larger biosphere upon which we literally depend for life, though it’s too often forgotten in the midst of our tech-ridden days. The show started with the cast leading the audience on little expeditions of their own, to get a taste of the process. 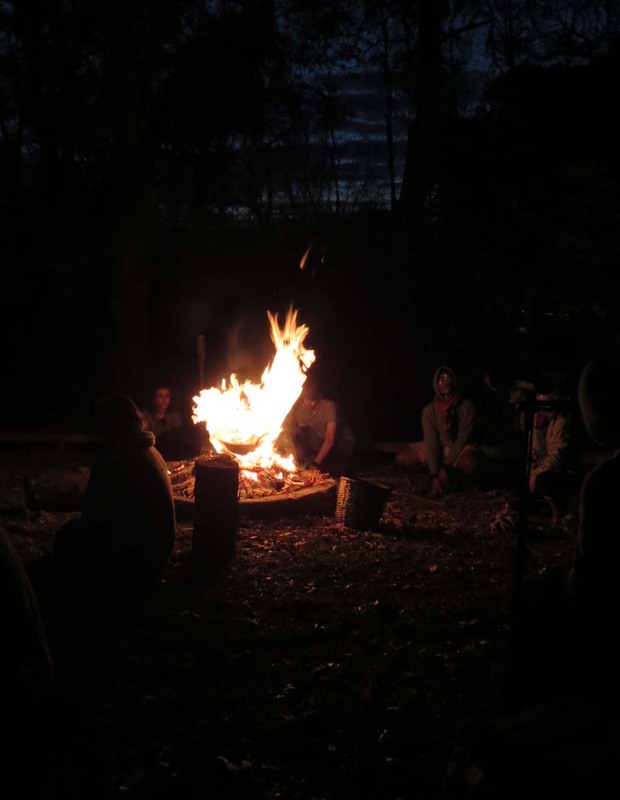 The audience got into the spirit of the wild by howling like wolves, after which they gathered in either the campfire circle in a woodsy nook of the arboretum, or in the lodge-like second floor space of the Urban Ecology Center. Rott’s company, Quasimondo Physical Theatre, co-produced the show, and like all Quasimondo works, the performance was a composition of movement, music and spoken word, linked not by narrative but in a thematic montage of free-association logic, organized around the narrative structure of the fieldwork plus the personal journeys of the participants. There were allusions to the different somatic practices, to wandering in the woods and encounters with various living things, along with vignettes created out of Rott’s fertile imagination, plus episodes from the history of the universe culled from Italo Calvino’s humorous short story collection Cosmicomics. Incidental music, both sprightly and haunting, was composed and performed by Ben Yela on an open-tuned acoustic guitar, while multi-instrumental percussionist Jahmes Finlayson supplied a virtuosic flow of background effects from his table of exotic instruments from bull-roarers to bird whistles. 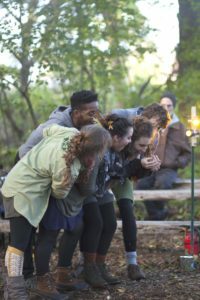 The players represent exceptional strength in physical theater: Yela and dancer Jessi Miller are Quasimondo regulars, while spoken word poet Kavon Cortez Jones has performed with that company; Sarah Best and Hesper Juhnke have theater education and devised theater backgrounds; JJ Gatesman is a Shakespearean actor and fight choreographer. This depth and range of talents and skills produced a tight, complex show that would daunt many conventional actors to attempt. The ensemble showed great good-humored commitment, whether they were embodying squirrels, portraying spiders, interpreting the body language of flowers, and impersonating single-celled organisms or hydrogen atoms. Some vignettes convey the childlike wonder of a goofy science cartoon; they were taken from sources that support the radical notion that humans not only don’t have a monopoly on sentience, but that some kind of feeling might actually permeate the cosmos to the atomic scale. 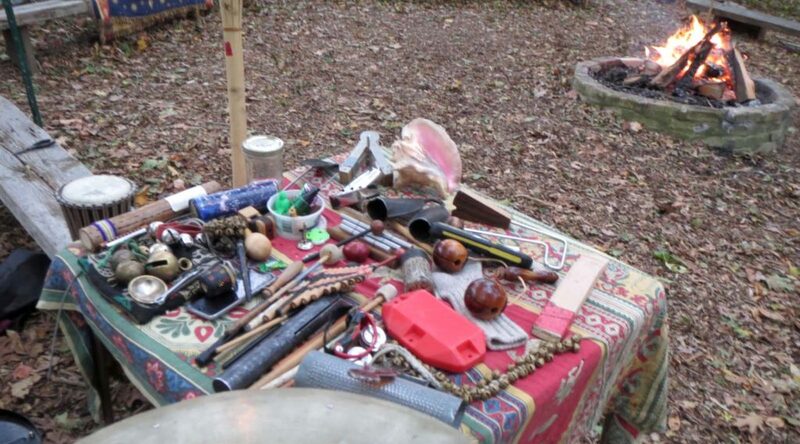 This idea has gained currency under the names “the new animism” and “object-oriented ontology,” but can be found as long ago as in prehistoric cultures and as recently as 20th century philosopher Alfred North Whitehead’s “philosophy of organism”—not exactly child’s play. 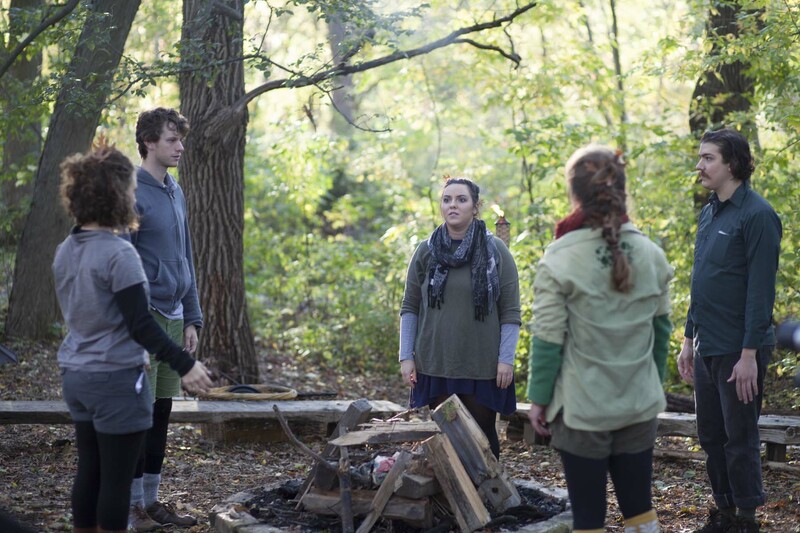 There’s a lot going on all the time; the performers, speaking candidly about their fieldwork experience, demonstrate a wide variety of styles of relating to the wilderness, creating unspoken conversations of subtle complexity. Sarah Best fully embraces her mission: though her enthusiastic “hope to connect” initially seems rebuffed by the busy creatures she meets, she finds solace in the rain; later she finds a “tiny city” in a fungus-grown leaf, and she feels “like a predator” while spying on an unsuspecting lady duck. Hesper Juhnke similarly embraces the experiment: after a humorously mosquito-ridden meditation session, she deploys crystalline precision in her examination of a tiny flying insect hovering at eye level. Later, she has a semi-romantic encounter with a sapling. “Will you dance with me little tree,” she sings. “Feel the wind in your hair, I mean, leaves . . . We can take it slow.” Her comic embodiment of a hoarding squirrel comes from intent observation; equal parts intelligence and empathy. By way of contrast, Gatesman and Jones seem to remain outside of nature looking in. Gatesman adopts the attitude of an explorer, scaling fallen trees and investigating empty spiderwebs, while Jones finds in nature a congenial setting for his poetic musings, but declines to engage with any actual living being. Ben Yela speaks of his existential anxiety in his wanderings: “It’s just life and death, life and death,” he rants—but then he finds a sense of wonder in discovering a plant he’s never seen before: “What the hell are you?” Jessi Miller is the social philosopher of the group, expressing deep ruminations in gestures and facial expressions. She becomes a growing tree, greedily grabbing resources: “You want water? MY water!” Later she delivers a mysterious soliloquy that conveys alienation; and then becomes the supervisor of the first road, satirizing the idea that destroying nature is serious, grown-up business: “Cut ‘em down, boys, they’re all the same.” Similar themes pervade the ensemble dance Miller choreographed: a shimmering flux of kinetic movements and images that explore humans and nature, power and dominion. After this section, the show still has humor, but it’s more pointed, darker in tone. Gatesman’s comic detective interrogates birds and flowers. He accidentally picks Best’s personified flower: she reacts tearfully. “There were things I wanted to do!” In the classic Oedipus trope of the investigator being the culprit, Gatesman turns on Juhnke’s squirrel and reveals himself as a predator. The cast howls from the offstage darkness, then stalks the audience on all fours, growling warily. The show ends on a ceremonial note, constructing a shape-shifting effigy out of branches, while leaves are tossed on the fire as an image of autumnal transformation. In keeping with the season, they acknowledge death and life as inseparable faces of each other. There’s no question that humans are the top predators on this earth, and that our activities are terrible for other life forms. But environmentalists make poor progress when they just talk about how bad humans are. Performance ecology tries a different tack: if we learn to care a bit more about even one little life form, we might care more about the impact our actions have on the whole planet. 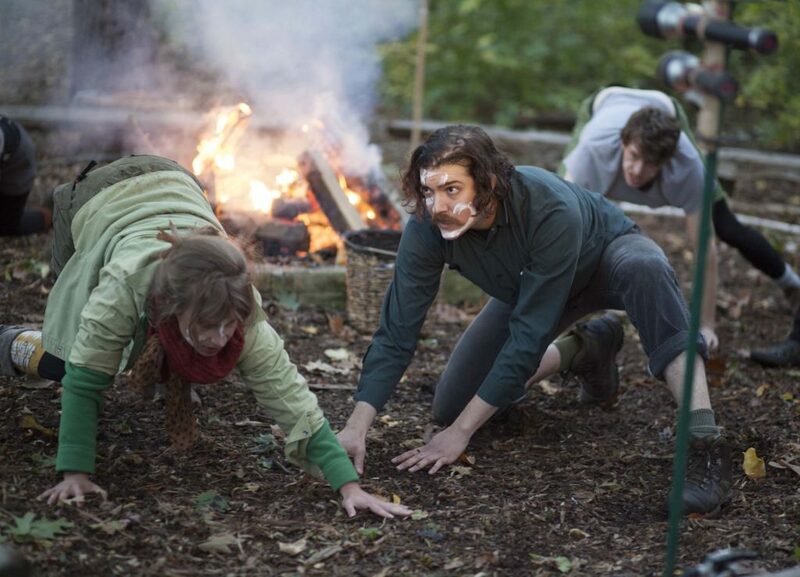 The Performance Ecology Project begins as the somewhat cartoonish adventures of six actors who go into the woods to do yoga and create a show about six actors who go into the woods and do yoga. There’s nothing terribly exotic or earth-shattering in their first-hand impressions of leaves, bugs and flowers. But to take the everyday and make it strange and new is the provenance of art, especially the avant-garde; through Brian Rott’s inspired staging, the performers’ energetic charm, and the novelty of the show’s premise, the hour passes quickly and absorbingly. Not every moment fully works, but everything serves a purpose. A well-made play is sometimes compared to a clockwork, each gear serving it’s specific function. This show is more like an organism—or the many different life forms in an ecosystem. That interconnectedness, including the interplay of varied voices and perspectives, gives this lighthearted essay a haunting feeling of mysterious depth. And somehow, through all the human filters, you might sense the stirring voices of numerous little lives, hurrying to get ready for winter—just like us.